Learn everything you need to know about your 17 week old baby. Track important developments and milestones such as talking, walking, growth, memory & more. By this week, your baby recognizes most of the sounds that make up her native language. In addition to her regular coos, you might hear her utter some vowels sounds now -- lots of aahs and ohs that she repeats over and over in a variety of pitches and tones. Your baby might also become fascinated by watching your face (especially the shape of your mouth) as you say different words. It's a sign that she's absorbing the ways that different sounds combine into syllables, words, and sentences. While her first word is still a ways off -- you'll usually hear it between 12 and 15 months -- your baby's getting the hang of vocalizing to get your attention. She'll even cough or click her tongue when she wants playtime. You might also notice her hair color or texture starting to change. Just like eye color, it can start to morph during the first 6 months of life. Soft hair might become coarser, fine hair can grow in thick, and pin-straight locks might go curly. It's also not uncommon for babies born with white-blond hair to go browner. And some babies this age lose all their hair. It takes a while for new locks to grow in, but there's no need to be alarmed about anything that's happening up there. Though the norm for first teeth is around 6 months, some babies begin teething as early as 4 months (or as late as 12 months). The telltale signs: drooling a lot, acting fussy for no discernible reason, gums that look red and/or feel hot, and possibly a mild fever. Teething doesn't faze some babies, but for many it can be uncomfortable enough to make them miserable, and worse, keep them up at night. To ease the pain, give Baby chewable teething toys such as plastic rings or a wet, chilled washcloth to gum during the day; the pressure and cold can be soothing. Your pediatrician might also recommend giving her a pain reliever, such as infant acetaminophen, at night to help her sleep more soundly, or applying a numbing medicine such as baby benzocaine to her gums. 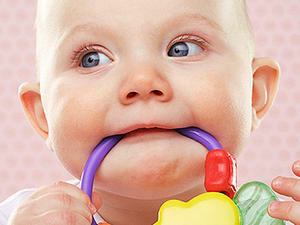 Sometimes teething symptoms can mimic those of an ear infection. If she has a fever, seems fussy, and tugs at her ears, it might be the latter. Or it just might be run-of-the-mill fussiness. New parents are quick to blame teething for whatever ails their baby, but sometimes your little one is just plain cranky. Either way, the best option will be to offer plenty of cuddles and wait it out together. If your baby has older siblings, she's probably done a lot more lately to win their affection than she did as a newborn. Now she's old enough to recognize all the loved ones in her life, not just Mom and Dad, and she's developing attachments to little family members. So when a big sister or brother walks into the room, your baby might break into a smile, kick her feet, or wave her arms with excitement. Because babies are fascinated by other children, older siblings might get an even more enthusiastic response than you do. And hopefully those smiles and coos will melt your other kids' hearts, just like they do yours. Let older siblings get involved in Baby's care. Offer to let them feed Baby a bottle or soap her up at bath time. Ask older siblings to make funny faces at Baby while you're prepping dinner. Set aside a basket of special toys and coloring books to keep sibs occupied while you nurse the baby, or read a book together (your little one can turn the pages for you). Head jealousy off at the pass by emphasizing everything your big kid can do that his little sister can't -- such as watch TV, eat pizza, and jump on Mom's bed. Give him hugs and kisses. The physical contact builds a connection with your baby and helps build his physical development.